Did General von Choltitz, the Nazi governor of Paris during its final days of occupation, and Raul Nording, the Swedish counsul-general, really meet cute the night before von Choltitz was to blow up the major cultural buildings of Paris and cause the Seine to overflow and kill millions of people? And did Nording actually talk him out of doing so? Some people say “yes”, some say “no”. Of course, petty details like that have never stopped dramatists before (see Schiller having Mary, Queen of Scots confront Queen Elizabeth I). And either way, it’s hard not to see the potential for a fascinating confrontation and battle of minds. So who cares if it really happened or not. Unfortunately, when it comes to the new German film Diplomacy, written by director Volker Schlӧndorff (of The Tin Drum and The Handmaid’s Tale) and Cyril Gely, who penned the play the film is based on, the two haven’t quite succeeded in fulfilling said potential. In fact, Diplomacy, with all its weighty subject matter, never manages to generate a lot of tension or forward momentum. And this in spite of the fact that the filmmakers have eschewed Roman Polanski’s approach in his theatrical film adaptations, such as The God of Carnage and Venus in Furs, in which that director basically just recorded a stage play (with a lot of flare and fun in the latter film it should be said; not so much in the former). Instead, Schlӧndorff and Gely don’t just dramatize the confrontation of von Choltitz and Nording, they also open up the story and generate a more action oriented, ticking time bomb (pardon he pun) through line by dramatizing some events that include the soldiers setting the explosives. But neither part of the story really works as well as one might like. These additional scenes, the soldiers setting the explosives, never feel convincing and come across as what they are…an attempt to create a more audience friendly movie rather than moments that organically grow out of the characters and situation (and begs the question, if you didn’t trust the source material, then why adapt it). And the scenes with von Choltitz and Nording sort of limp along because there is very little of dramatic weight in their meeting. Which, yes, seems odd, but there you have it. When Nording first sneaks into von Choltitz’s hotel room through a secret passageway a King once had made so he could visit his mistress (I told you they meet cute), the story doesn’t go anywhere because there really isn’t much of an argument. Von Choltitz is going to do as ordered and the only reason he gives is because he’s a soldier and soldiers obey orders. Well, okay, but since there’s really not much you can say in argument against that, Nording isn’t left with anything to say and he proceeds not to say it. There’s no real intellectual battle of any interest here, no grand and passionate argument because there really can’t be. Von Choltitz has nothing at stake in the conflict, not even a guilty conscience or his self-worth as a human being. Von Choltitz is so dead set on obeying orders, there’s no place for the conflict to go. The only thing that can happen here is a robust and original and intellectually stimulating argument between the two characters and that really doesn’t happen. No one has anything of that great interest to say. It’s not until the second half that it’s revealed that there actually is something at stake for the general and that is his wife and children who are being held semi-prisoners in case von Choltitz doesn’t obey orders. And at this point, the story does pick up some interest and there is some suspense, but the arguments and battle of wills don’t get much better. All we have are the rather clunky, overly familiar and even clichéd action scenes. It also may not help that the audience knows what the ending is. I mean, we all are fully aware (unless you are the product of the American education system, then who knows what you know) that Paris wasn’t destroyed and that von Choltitz didn’t give the orders. So if we know the ending ahead of time, which means there’s no inherent suspense, there has to be something else going on to keep our interest up and I’m afraid there just wasn’t for me. With the great Niels Arestrup, who first burst on the scene over here in such films as The Beat that My Heart Skipped and A Prophet, as von Choltitz, and Andre Klaussner, who has been in everything from Amelie to Tell No One to Micmacs, as Nording. Both of them recreate the roles they played on stage. I suppose that if we, over here in the good old U.S. of A., can make a movie like Dave (you know, the one where Kevin Kline, a presidential impersonator, ends up impersonating the president), then the Italians have every right to make a movie like Viva la libertà (Long Live Freedom). In this film written by Angelo Pasquini and the director Robert Andó (who also wrote the book the movie is based on), Enrico, the head of a major party in Italy (which party might be clearer if one is Italian, but it looked like the liberals and/or Communists) is the head of said (or not said, as I said, it’s a bit unclear) party because, well, because there really isn’t anyone else right now. You see, Italy has been in decline for some time and Enrico’s party, the one that is supposed to stand for the workers and the common man, has let their followers down by not having a clear message or vision for the future. They are losing the respect of their party members because they have nothing to offer and, perhaps even worse, Enrico doesn’t have the personality to not offer it and still keep the party going. So he takes off. Just disappears. There’s some indication he did it to prove to all and sundry that they can’t get along without him. But at any rate, he knows that things aren’t going well and he needs to get away, so he looks up an old girlfriend (wispy voiced Valeria Bruni Tedeschi, who seems to be in every other Italian film these days) from his earlier days when he was interested in film. She lives in Paris now with her film director husband and little girl and she takes him in, no questions asked. So what’s a party to do? Well, Enrico’s disappearance leads his number two man, Andrea, to Enrico’s twin brother Giovanni. The solution to their situation: bide time by having Giovanni take Enrico’s place. The problem: Giovanni, a philosopher and author, has just gotten out of a mental institution. The result: while Enrico gloomily leads his life in Paris trying to find himself, Giovanni is so charismatic with a delightful personality and a commanding presence, that he is able to rally his party and bring them together to fight for a better future. Viva la Liberta is often fun and funny. And droll. It’s also often rather droll at times. 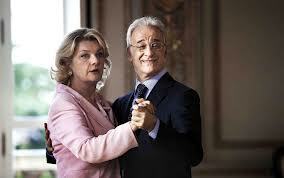 This is mainly because of Toni Servillo’s performance as the twin brothers. 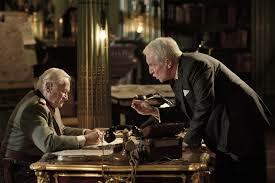 Servillo is one of Italy’s greatest actors (if not the greatest) and one of the finest in the world. He is able to give strong individual characters to each brother, while still making it believable that no one can tell them apart. He shows great empathy as Enrico and makes you understand why Giovanni could rally the troops, so to speak. His performance is more than aided and abetted by Valeria Mastandrea as Andrea. There is something so soulful and lost in Mastandrea’s sad eyes and wistful looks (characteristics he also showed as the lost son in the movie The First Beautiful Things) that one can’t help but be emotionally invested as he realizes that he hopes that Enrico never returns. The movie never really comes together, though, as strongly as it might. First, one has to buy the plot turn that in a country that gave us the word paparazzi, no one has ever heard of this twin brother who published a book. And the politics seem a little too vague. The party is letting their followers down because they have nothing to offer them, no real future, no ideas, no platform. But neither does Giovanni. He gives a great speech. He’s inspiring. Once can easily see why he excites the people. The problem is that he also has nothing to say. He also has no ideas, no platform, nothing to offer them. He’s just better at saying it in a way that gets the people on his side. As a result, his speeches become sort of repetitive and empty and start to lose tension and meaning. And I’m not convinced that was the point of the movie, that it’s a mocking and tongue in cheeck comment on a party whose solution is not to change and become a real political movement, but to find someone who can get people on their side even though they have nothing to say. You know, like the Republicans have been trying to do. In the end, this is a political satire that is both sharp and blunt. And I’m not sure that’s to the benefit of the movie. Citizenfour is a documentary about Edward Snowden, the computer geek turned folk hero who leaked national security documents about our government collecting personal information on its own citizens, as well as populaces of almost every country on the planet (including, but not limited to, German Chancellor Angela Merkel), and who ended up taking political asylum in Russia. It’s the sort of movie that outrages you, or should (and it does, at least as long as one is in the theater), as it demonstrates the possibility of a George Orwellian future. Perhaps the only thing keeping us safe right now is that so much information is being gathered that no entity can really wade through it on a regular basis—that, and the at times gang who couldn’t shoot straight incompetent nature of our various national security agencies. Neither caveats fill me with that much comfort right now. The first half or more of the movie is mainly just the camera focused on Snowden himself as he talks and talks and talks…and talks. Now I’m sure that if I met him in real life, I suspect he would be a great guy to sit around with and have a beer. But as someone who has a camera strictly focused on him, he’s not the most charismatic of characters. These parts don’t have a lot of tension and tend to meander on. What is really odd here is that when Snowden first speaks, he tells director Laura Poitras that he is afraid that if it is revealed too soon who it is who is blowing the whistle on what the NSA et al. is really up to, that the story will become about him. But in many ways, by so focusing on Snowden, that’s sort of what Poitras does (for the record, Snowden is a bit vain and is constantly confounded by his hair which just won’t lay right no matter how much mouse he uses). 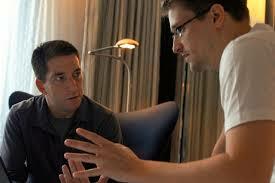 The strongest aspects of the documentary are when the film gets away from that claustrophobic hotel room and shows how the leaks are affecting the rest of the world: reporter Glenn Greenwald reuniting with his Brazilian boyfriend after the boyfriend is held and questioned for nine hours; the newspapers trying to figure out what they can print and what they can’t; the various speaking engagements the characters have trying to explain just what is going on and how the government is working with various internet sites (like facebook, apple, google, etc. ); Obama’s unconvincing and weak response to Snowden’s actions; and a hearing with a former NSA analyst that was stopped when it was discovered there was a CIA double agent in the meeting. Perhaps what is saddest about the movie is the unintentional implication that Snowden and the involvement of the NSA in spying on its citizens is just another flavor of the month. He’s come, he’s gone and no one’s really talking about him much or what the various U.S. security agencies are doing or whether we should stop them (at least, my facebook thread hasn’t had much to say about it lately). I mean, after all, when all is said and done, much of the talk about Citizenfour these days is not its content and what it means, but whether it will win best documentary at the Oscars this year.